Heading into a season opener, coaches always wonder just how good their team might be. After Friday night, Blue Valley and Bishop Miege both know—pretty good. The two Kansas powers battled back and forth in the Eastern Kansas League opener, which Blue Valley held on to win 35-28. There’s no false hope in the two teams’ offenses. 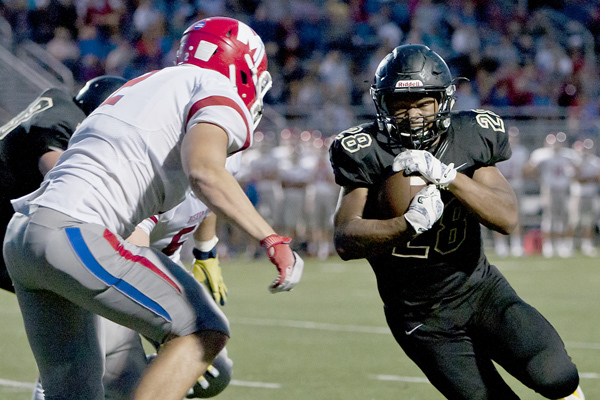 Blue Valley and Miege racked up a combined 959 yards of total offense. That included 336 passing yards from Blue Valley quarterback Matt Dercher and another 351 from Miege quarterback Carter Putz. Even with all the offense, it was a pair of defensive stops by Blue Valley that sealed up the win. Twice in the final five minutes, the Tiger defense stopped the potent Stag offense. First, Brody Jacobsen picked off a pass in what could have been the game-tying drive by Miege. Then, defensive end Max Molitor ended any comeback hopes, when he sacked Putz on a fourth-down conversion with 1:38 left in the game. While both teams had no trouble getting the ball moved through the air, the difference in the game came from Blue Valley running back Will Evans. The bruising running back gained 182 yards on 36 carries including the game-winning score in the fourth quarter, his second of the night. The one-on-one matchups were clearly in Evans’ favor as the 207-pound back rolled over defenders most of the night. Evans found the end zone in the second half, but it was the connection between Dercher and receiver Gus Gomez that got the Tigers started early. The duo connected for all three of the Tigers other touchdowns. “We are going to be pretty balanced this year and that’s going to make teams have to defend the whole field against us,” Driskell said. Miege had four different players find the end zone. On the opening drive of the game, Putz connected with Landry Weber on an eight-yard score. Weber, played a big role in the second score for the Stags as well, hauling in two long passes before Cameron Clark scored on a two-yard run. Miege trailed 14-13 heading into the half, but took a 21-14 lead on a pass from Putz to Tommy Winklhofer. After the Tigers answered, the Stags once again fired back, this time with a 65-yard touchdown pass to Jafar Armstrong. Despite leading 28-21, Miege would eventually give up the lead. It was only the second regular season loss in the last three seasons for the Stags, both which have come to Blue Valley. “That’s what we expected coming in,” Holmes said of the tight game. “We knew it would be that type of game, anytime you are playing against a team like Blue Valley. We knew Coach Driskell would have his guys ready and they made one more play than we did tonight.